Modern dentistry is making progress leaps and bounds to offer functional and cosmetic improvements to your smile. Traditional braces have dominated the scene of orthodontics for decades, but clear aligners are now gaining ground. Invisalign is a branded clear aligner system for the correction of misaligned teeth. It has the distinction of being the pioneer in the field of clear aligners. Invisalign has clearly taken the field of orthodontics by storm due to its multiple merits. But is Invisalign really better than braces? That is a moot question. We cannot decide it for you but certainly, we can give you information which will help you make an educated decision. There are many forms of dental braces, which are all variations on the basic traditional braces. So, only the traditional braces will be described. These consist essentially of a strong steel wire called the archwire because it forms an arch around your teeth. To this archwire are attached tiny brackets, one bracket being firmly attached to each tooth. Once the archwire is attached, the teeth start to move in the direction desired by your dentist. As the teeth move, the forces on them diminish. As a result, the movement slows down. Your dentist will adjust the tension in the archwire again and the teeth start moving again. This process is repeated fortnightly or monthly till the teeth take the positions as planned by your dentist. This process can take two to three years depending on the complexity of the case. After the desired movement of teeth has been achieved it must be consolidated. Else, the teeth tend to revert back to their old positions. Sometimes, the dentist may have to extract one or two teeth to make space for the proper movement of the remaining teeth. Invisalign is one of the clear aligners on the market, and a branded offer of the Invisalign company. This system was developed by an engineer who wanted to overcome the problems he saw with the braces. The aligners are a set of numbered shells made of clear bpa free plastic which are made specifically for your teeth using leading-edge technology and orthodontic expertise. These shells, or aligners, are to be worn on your teeth, you only remove your aligner is for eating or drinking. The first shell is so made that it exerts forces on individual teeth according to a plan made out by the dentist in advance. In about two weeks’ time, the aligner has moved your teeth to an intermediate position in the right direction and the forces on the teeth diminish (as also in the case of braces). At this time, you discard the first aligner and put on the second aligner in the set. This one is also worn for two weeks and moves your teeth further. Similarly, the third one and the subsequent ones move your teeth gradually to the final, desired position. 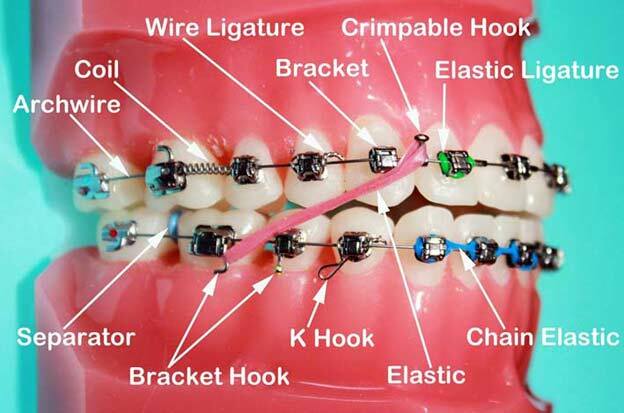 There is not much custom fabrication required in the case of braces. Dentists use readymade wires, brackets, and other minor components. But the aligners have to be custom made for you using state of the art computing and manufacturing facilities. Your dentist will take x-rays and make impressions of your teeth and digitizes them into a computer loaded with a custom-made software. A three-dimensional image of your teeth and jaws is made on the computer. The software is able to display various views of your teeth on the computer screen. With the help of this data and sophisticated software, the dentist plans the movement of your teeth through intermediate stages to a final optimum position. Your dentist will tune up the movement plan and the number of intermediate stages. He or she may even show you the smile you should expect to possess after the treatment is completed. Once the plan is finalized, the data is transferred to computer-aided machines which produce the set of aligners for you. These aligners are machined out of special grade clear plastic which is invisible and biocompatible. These aligners are pre-numbered in accordance with the order in which those are to be worn. A major snag with the braces should now be obvious to you. The archwire and the brackets are visible and will look odd when you smile. Various efforts have been made to counter this drawback, for example, tooth-colored brackets and archwires. Lingual braces are worn on the insides of the teeth, but due to limited space, they can interfere with proper tongue movement. In fact, some people may not have enough space to allow lingual braces. And the tooth-colored wires are not really invisible after all. 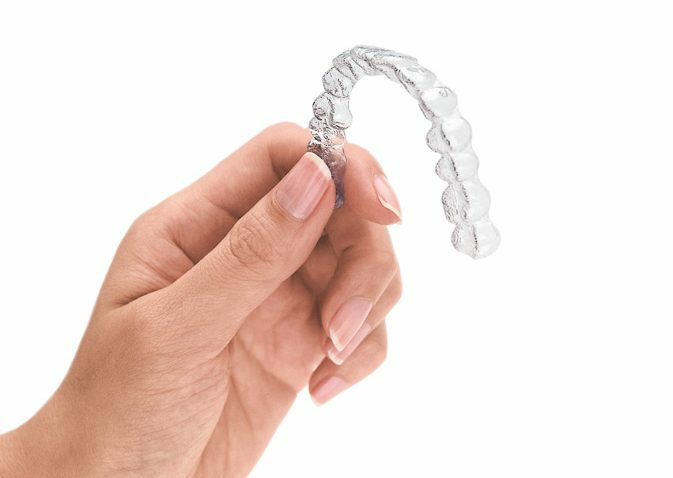 The Invisalign aligner system, in contrast, is made entirely from clear plastic which is virtually invisible. Treatment time varies from case to case, but generally, the treatment time is less for braces. This is because braces exert higher orthodontic forces which move your teeth more quickly in the desired direction. Treatment time with Invisalign aligners also takes longer because its efficacy is dependent on patient compliance in wearing. The braces need to be readjusted periodically. The patient has to get an appointment and visit the clinic. The Invisalign has the advantage that the patient is given all the aligners at once. Then he or she can move on to the next aligner without having to go to the dentist again and again. Since braces have wires, which must be cut to size and bent using hand tools, sharp edges may remain and bruise the cheeks etc. The plastic aligners do not have such a disadvantage. In fact, they are quite comfortable to wear. Can Invisalign correct all the dental defects which braces can? No. Invisalign can only be used for the correction of mild to moderate orthodontic problems. The braces, on the other hand, can correct a much larger range of orthodontic problems. Since it is a cosmetic orthodontic system, treatment with Invisalign aligners is more expensive. In the case of brackets, the cost is relatively less. However, the actual cost of your treatment depends on the severity of your case. Braces will be effective at all ages where tooth movement can be achieved. Early designs of Invisalign were not suitable for teens because new teeth would not find any room to erupt, Later designs incorporate removable tabs to allow for erupting teeth. Braces are permanently installed by the dentist and can only be removed by the dentist. The wires and brackets make oral hygiene complicated. On the other hand, the Invisalign can be put on and removed by the user at will for eating and cleaning. The teeth can be brushed and flossed before putting the aligners back on, this should be done to avoid staining. Which One Should I Choose Then? This question is difficult to answer because the information we have given you is not really sufficient for you to make the correct decision. If your dentist thinks your case beyond correction by Invisalign, you have no choice. In case Invisalign can correct your defect then the decision will be based on your aesthetic preferences and your financial options. It is best to consult a good orthodontist and then take a decision.